It may be a little too early to say this, but this game could be a must win for the Ravens. The Birds are back at M&T Bank, where they have been pretty good this year. The only problem is that the Bengals are in town. The Bengals are the favorite to win this(for obvious reason), but I expect this to be a tough battle between AFC North foes. You can read my reaction to last weeks loss for the state of the Ravens. They need to play better in the secondary and the offensive line needs to start blocking. The front 7 have been playing well all year. The offensive skilled positions have not had holes or time to get open because of the lack of blocking. Joe Flacco needs to emerge as a leader and win this team some games, even with the struggling secondary. The Bengals enter Sunday’s game 6-3, and fresh off an overtime loss to Miami last Thursday. They have had plenty of time to recover and prepare for this weeks game. They boast 7th best passing attack and 19th rushing. Two words: A.J Green. I would suspect the Ravens to double him and/or shadow him with a safety over top. Good luck to the Raven’s corner who gets that duty. The Bengals O-line has been pretty good this year in their pass and run blocking. Andy Dalton has been improving all year and has time and weapons. They feature a 2 back system with BenJarvis Green-Ellis and rookie playmaker Giovanni Bernard who has also been getting better week by week. Marvin Williams had a 4 TD game two weeks ago and Sanu is decent, but AJ Green is their only solid WR. TEs Gresham and rookie Tyler Eifert can stretch the field and block. They cause mismatches with LBs and Safeties. This is very good and balanced offense. The Ravens D needs to rely on pass rush, shutting down the run, and limiting big plays. The Bengals will pass for 300 yards, but AJ Green and Sanu need to be kept under check. They need to give up the underneath routes and play a bend but not break style defense. Let the D-Line pressure Dalton into a mistake or 2 that could change the game. Defensively, the Bengals are one of the best in the league, 11th in passing and 10th in rushing. The loss of Geno Atkins is huge, but they have pretty good replacements for him. The Ravens will be unable to run against the front 7. Burfict, Maualuga, and James Harrison are all run stoppers at Linebacker. The D-Line includes run stopper Domata Peko, and edger rushers Carlos Dunlap and Michael Johnson. This is a scary front 7(without Atkins). Corners Adam Jones, Terence Newman, and nickel Dre Kirkpatrick are decent but nothing too special. Safeties Reggie Nelson and George Iloka have been very consistant this year. The Ravens need to isolate Torrey Smith on one of these corners. Throw him slants, curls, crossing routes, and screen early. Get the ball in his hands. After repeated short attempts, get him on a double move with max protection. Utilizing Smith will be essential for a win. Ray Rice, Bernard Pierce, and TEs Dickson and Clarke should be used in the passing game as well. Burfict is the only one who can cover, so getting Rice on Maualuga or Harrison should be easy checks for Flacco. Dickson and Clarke should be able to find holes in the middle of the field. 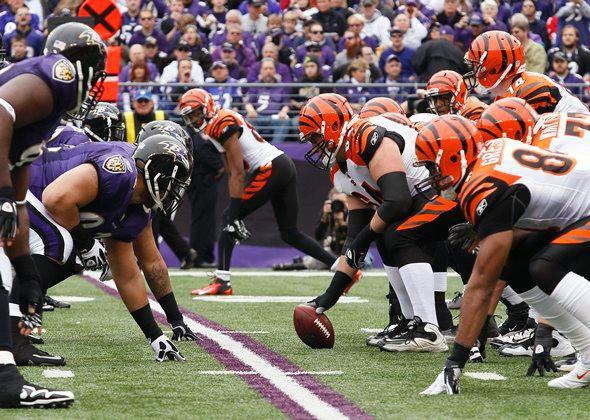 Flacco needs to make calls and audibles at the line depending on what the Bengals line up in. Prediction: The Bengals are too good of a team to lose this game. 27-17 Bengals. Only way Ravens win is if their RBs go for 100 and 1+TD and Torrey Smith hits 100 and 1TD(must keep AJ Green under this as well). This entry was tagged Adam Jones, AJ Green, Andy Dalton, Baltimore Ravens, Bengals, Bengals at Ravens, Bernard Pierce, Cincinnati Bengals, Gino Atkins, Giovanni Bernard, James Harrison, Joe Flacco, Ravens, Ravens vs. Bengals, Ray Maualuga, Ray Rice, Reggie Nelson, Terence Newman, Torrey Smith, Vontaze Berfict, Week 10 NFL. Bookmark the permalink.